Extract courtesy of Bob Davis, 9-7-2005 "The official guide to the Circuito, published on 3 September, for the first time presented a complete list of aviators participating in the events, proudly noting that they were truly international. Actually, only one American was coming, and the competitions were mostly an Italian-French affair, as the Brescia car races had been. The guide registered the following entrants:"
"People informed about recent technological advances and the Rheims races could see immediately that the gathering was a rather mixed bag of amateurs and professionals, illustrious stars and also-rans (reflecting the contemporary situation of aviation), and while the visit of the French dirigible was a welcome gesture to add to the attractions of the show, the committee would have been hard pressed to say with whom the Comte de La Vaulx was going to compete. In practice, it turned out that the competitions were a matter of the professionals, among them Curtiss, Bleríot (rather disappointing), Rougier, and Caldera; the others were far less visible, for they had to tinker endlessly with their contraptions, were unable to leave the ground, or immediately crashed, the pilots unhurt." By ERNEST JONES The following entries have been selected from the complete list of all those who piloted power airplanes anywhere in the world to the end of 1908, so far as the record seems to show in press items, aeronautic journals and official reports. It was assembled by Early Bird Ernest Jones. To access the entire list of 35 pioneers, click on the title above. via email from Terry Hughes, 9-5-05 I am fascinated by the exploits of the early balloonists, some of whom had the most extraordinary ideas. In particular I have been researching the exploits of Count Henri de la Vaulx. I am sure you know that he created a remarkable long distance record flight in October 1900 when he flew 1,193 miles from Paris to Korosticheff near Kiev. His maximum altitude was 18,810 feet and he made the journey in just under 36 hours. Is there either a biography or autobiography of the de la Vaulx? I am interested in the technology he might have used. Editor's Note: If you can help Terry with his search for more information, I will be happy to forward your message to him. ONLINE RESOURCES If you search for "Count Henri de la Vaulx +aviation", using the Google search engine, (9-4-03), you will find about 16 links. THE FLYING MACHINES EXHIBIT This page, on the website of Wright State University Libraries, you will find a brief biography of Vaulx and an image of a postcard of the era. While on the website, you should take advantage of the opportunity to enjoy the many other bios and postcard images which are available. You can access the page by clicking on the title above. If time permits, you may want to visit some of the other sites which have been found by Google. FRANCE TO RUSSIA BY BALLOON. from the Google Books Library Project THE balloon race for the Grand Prix which was started from Paris on October 9, 1900, marked the culmination of recent efforts on the part of the Paris Aero CLub to stimulate popular interest in ballooning. 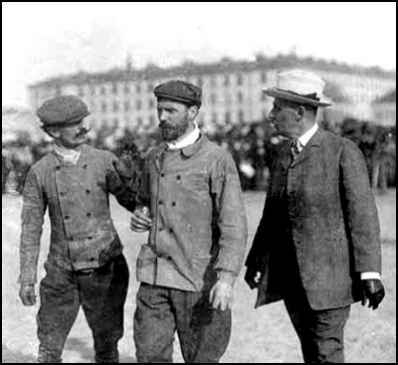 In this race two of the members, Count Henri de la Vaulx and Count de Castillen de Saint-Victor, in the balloon Centaur, made the entire distance from Paris to Korostichev, Russia, 1,153 miles as the crow flies, in 35 3/4 hours, or an average speed of 32 1'/4 miles an hour. "Our direction at the start was north-north-east, and very soon, the sun having gone down, Paris was nothing for us but a vast, vaguely defined patch of luminosity far to the west. The Centaur was in equilibrium at about 5,000 feet above the sea-level, when the moon rose with such a radiant brilliance that we could read all our instruments without the aid of the electric lamp. Every now and then a shooting star traversed the vault of heaven, inciting us to wish fo the success of our enterprise." The first race should start from Paris under the auspices of the Aero Club de France, and in subsequent years should start from the country of the winner of the preceding year's race. The winner to be the balloon making the longest trip from the point of ascent to the point of descent measured on the arc of a circle. Not more than three balloons should be allowed to represent each country. The first contest for this cup was held on September 30th, 1906, when sixteen balloons, representing seven different nations, started from the Tuileries Gardens in Paris. The result was a win for Lieutenant Frank P. Lahm (America), who landed at Flying Dales in Yorkshire, a distance of 401 miles from Paris. Signor Vonwiller (Italy), who landed at New Holland, Yorkshire, distance 367 miles, was second, and the Hon. C. S. Rolls (Great Britain), who landed at Sherborne, in Norfolk, a distance of 286 miles, third. The latter was nearly approached by Count Henri de la Vaulx, one of the most noted French aeronauts, who landed at Great Walsingham, in Norfolk, having covered a distance of 284 miles. Three other balloons reached England, the remaining nine descended at various points between Paris and the French coast." "In 1909, municipal authorities built an airfield in northern Italy and invited leading pilots to compete on it. The show attracted thousands of spectators -- among them Giacomo Puccini and Gabriele d'Annunzio -- and reporters, including Franz Kafka, Max Brod, and Luigi Barzini. Peter Demetz's book tells the story of what happened in the air and on the ground before, during, and after this historic moment. Kafka, it turns out, was a very precise observer of both the fragile new machines and the people who flocked to see them in action. Demetz shows us the spectacle as Kafka reported it, and also its unexpectedly melodramatic preparations, amazing dirigibles, and ace pilots -- the American Glenn Curtiss, the Italian Mario Calderara, and the reigning king of the skies, Louis Bleriot. 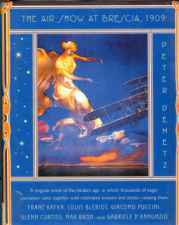 But above all Demetz wants to know what flying really meant to these visionaries of the air: many political and imaginative issues were sent aloft at Brescia. With affection, he describes Kafka's subtle ambiguities about the consequences of flight, d'Annunzio's lust for power in aviation, Puccini's enthusiasm for speedy escapes, and Curtiss's modest heroism. Illustrated with material from the show itself, this book reveals a vital point where art and technology met in imagining the future." "Only on September was it announced that the French airship had been fully inflated and that Comte de la Vaulx was ready to ascend; on 14 September a curious crowd gathered on the meadow in fron of the hangar (entrance fee, one lira), only to be disappointed because the commander had decided to postpone the flight owing to the unstable weather. "On the morning of the fifteenth, everybody was ready at ten, but the count still hesitated. His little Pirelli weather balloon, at an altitude of one hundred meters, signaled a windy day, and it was raining off and on. "The next day, La Vaulx was ready to fly his airship to the aerodrome and back with Luigi Barzini as his passenger of honor. The day was sunny and calm, and thousands of enthusiasts, inside and outside the hangar, waited to see the ascent, scheduled for 10:00 A.M. But the bersaglieri platoon to handle the ropes did not show up - "for excellent reasons," Barzini reported, because they were eating breakfast at the barracks. The airship had to be towed out of the hangar by amateurs, among them, on the port side, Orefici, the mayor of Brescia, and on the starboard side none other than the maestro Arturo Toscanini, who had come from Milan with his wife; an airship was never handled by more elegant gloved hands and more select personnel, wrote the reporter. Editor's Note: This is just a sample of the story about Vaulx. I am Norma Sosa, live in Argentina and do my research about De la Vaulx´s voyages in Patagonia. I can tell you he died in an spectacular accident when in 1930 was flying from Albany to New York in a plane of Canadian Colonial Airways . If you have any information about his personal life un France , please let my know. Editor's Note: I was unaware of the Count's travels in Patagonia and have not been able to find any relevant links using Google on the net. Also, the only information I have as to his life in France is what you find on this site and its links. If you can help Norma and me with any information, we would both be very grateful. Comte Henri de la Vaulx appears to have died in 1930.